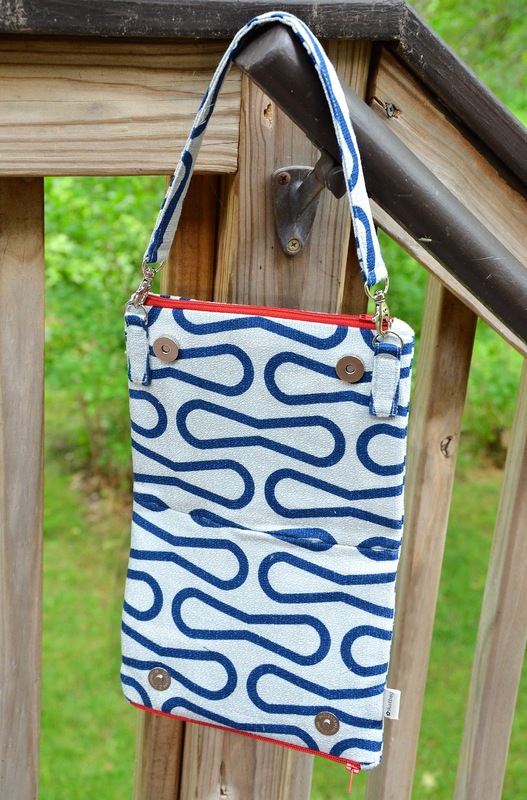 This little clutch was inspired by something I saw in Old Navy last year. Disclaimer: I'm not a clutch person. I have young children and not enough hands for all of them, let alone for a purse. So whenever I'm out shopping, I like to stop by the bag aisles to see what's trending, but I always avoid the clutch/small dainty purse section. This clutch, though, was attracting attention by sitting out-of-place on the jewelry shelf, so I was tricked into looking at it. 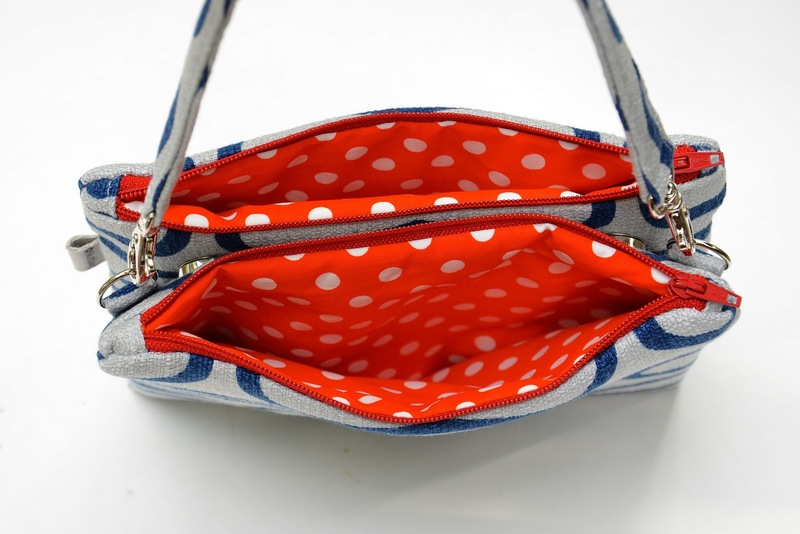 And I thought it would make a very good example for our series, since it's a straightforward construction, and a clever variation on that Ubiquitous Edge-Zippered Pouch from the last post, to boot. So here, in Jessica Jones' Time Warp Navy Loop by Cloud9, I give you . 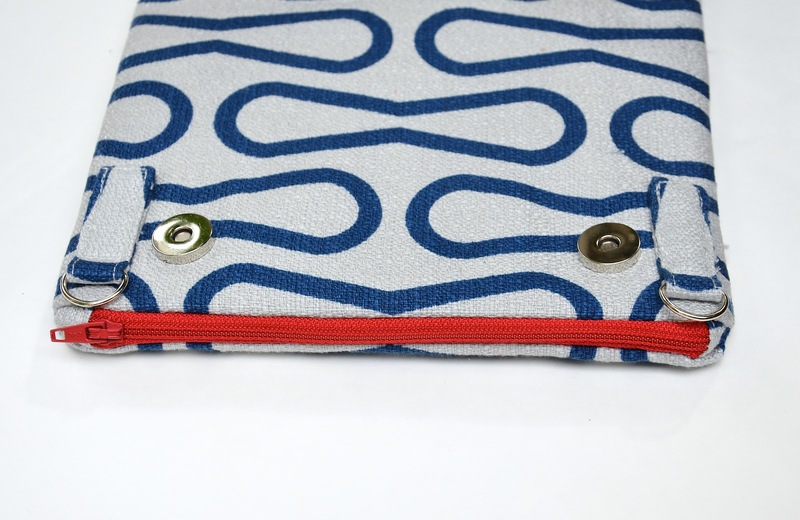 . . the Twin Zippered-Edge Clutch! You can tell, just by looking at it, that it's really just two of those dime-a-dozen zippered edge pouches stuck together, right? Which means you actually already know how to make this, even though you might not have realized it. But shall we do the tutorial anyway? Okay, I must warn you that I am going to be using a disgusting word in today's post. Sometimes, when I write tutorials, I struggle to find a word to convey exactly what I mean. 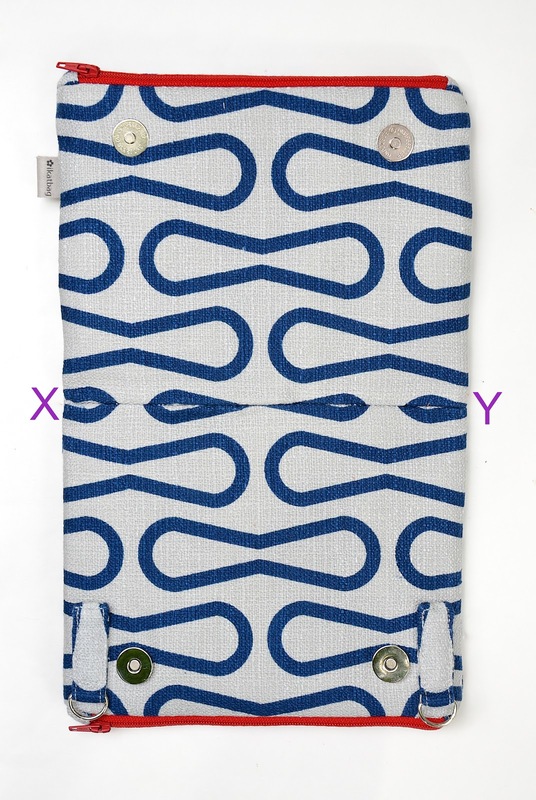 And when I was putting this twin-clutch tutorial together, I struggled to name that dividing wall thing between the two pocketed compartments. Then I remembered that word from my childhood. Let's not discuss why I used that word as a child; I don't know. All I knew was it had to do with hearts and nostrils and cartilage, all of which interested me and, somehow, I was familiar with that word. Here's where it is when the clutch is unstuck. It's so inappropriate for a bag, and makes my hair stand on end. Now, in the field of psychology, when people have an aversion to something (e.g. caterpillars), one method of treatment is to overexpose them to the nasty thing (the clinical term is "stimulus") so they hopefully develop a mental immunity from getting used to its ickiness. This technique is known as "prolonged exposure therapy" or, more charmingly, "flooding". Ooooooookaaaaaaaay. We are all hereby cured. Moving forward now: you're all familiar with the zippered edge pouch construction sequence, yes? 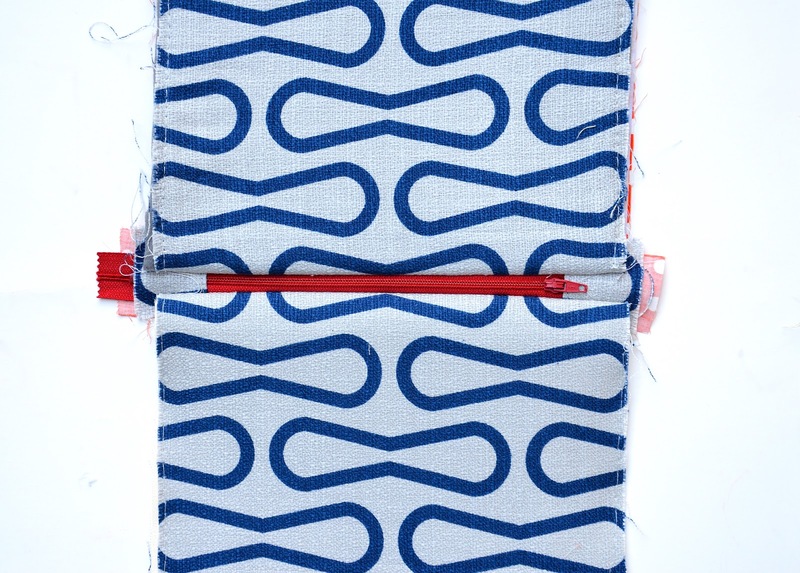 This one is the same, except we're making TWO zippered pouches simultaneously. 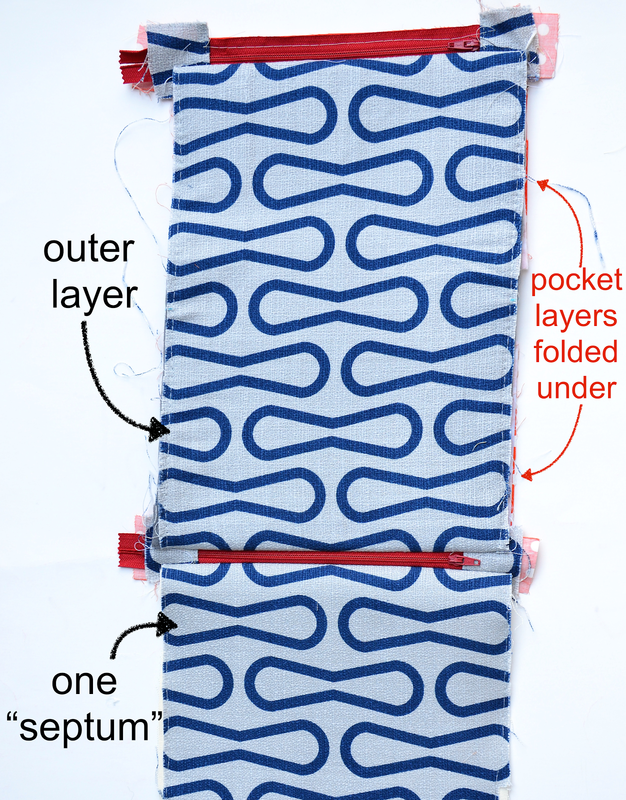 Attach a zipper to each short end of the outer layer piece. Face each zipper with one pocket piece. 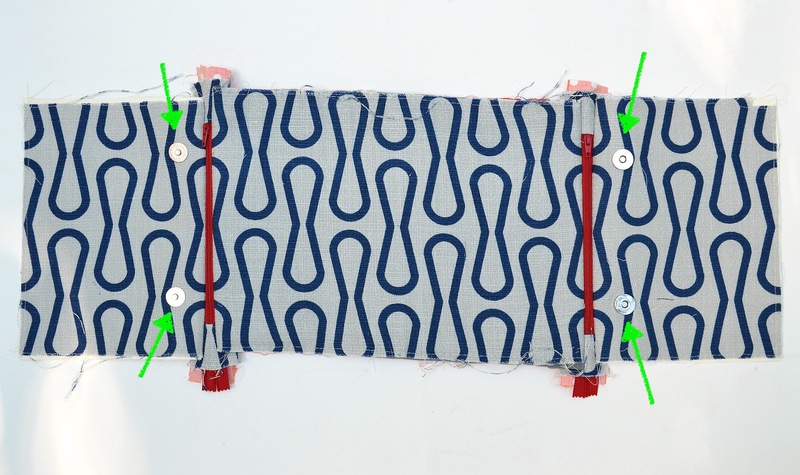 Remember that we're sewing only along ONE edge of the zipper tape of each zipper. 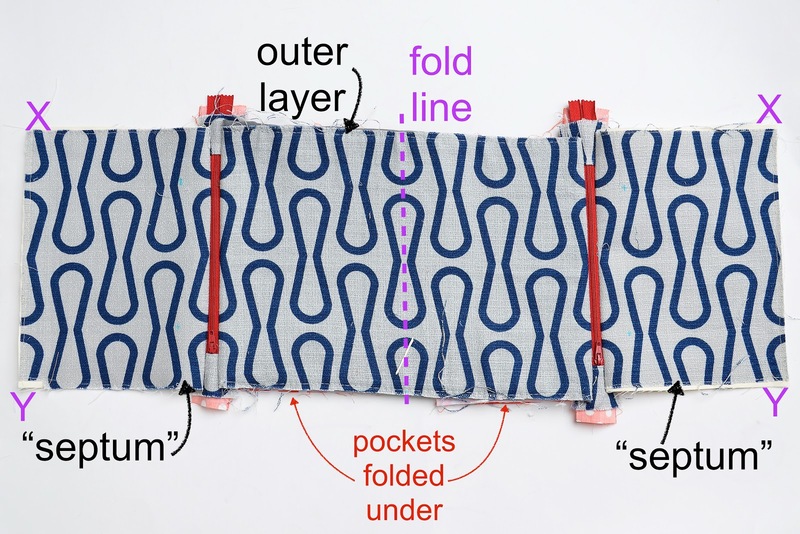 Visualize this: the purple dashed line is where the outer layer piece will fold to bring the twin zippers to the top of the finished clutch. 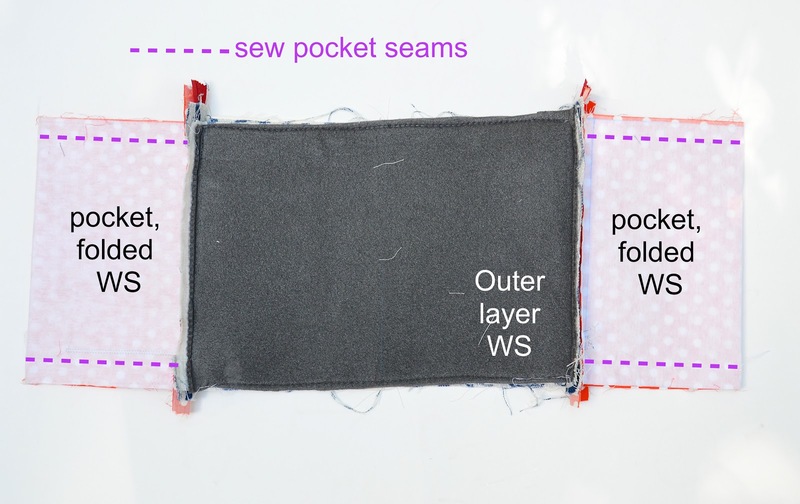 Because the pocket pieces will also fold in half to tuck inside the finished pouch, they're best made a little smaller than the outer layer piece. We cut them the same size initially, but trim them down as we go along so they fit. 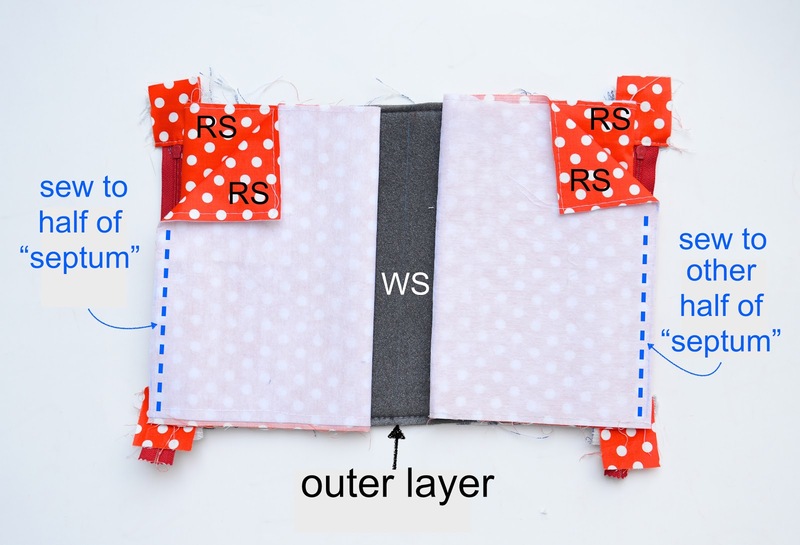 I prefer doing this to cutting them smaller in the beginning because I never know how tight all the layers will fit together in the end, particularly with thick fabrics/batting/stabilizer layers. At this stage, it's sufficient that the widths B are less than the width A. In this step, we'll be facing the remaining edge of the zippered tapes. Cut the septum piece in half to make two separate septum pieces. 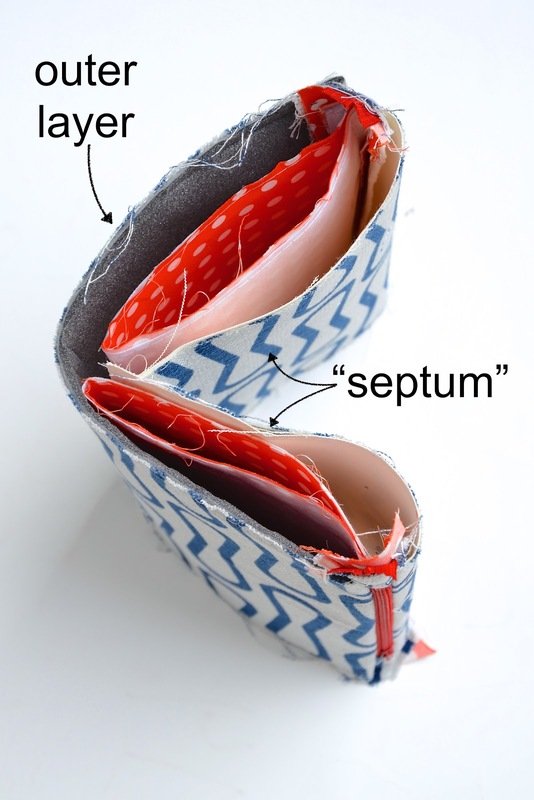 Don't worry about SAs at this point - because the septum is the innermost folded layer, it will naturally have leftover fabric width for SAs. 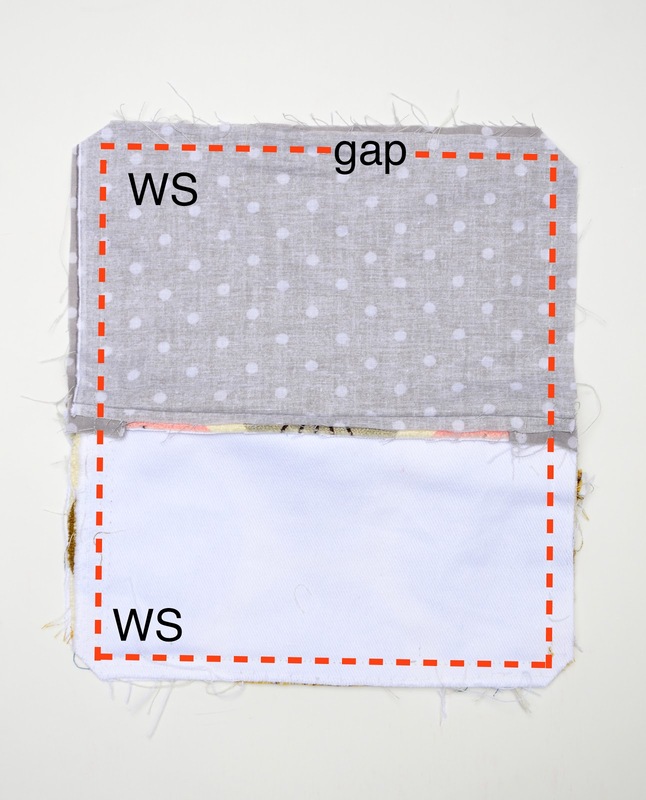 Flip the ensemble from Step 1 to its WS. 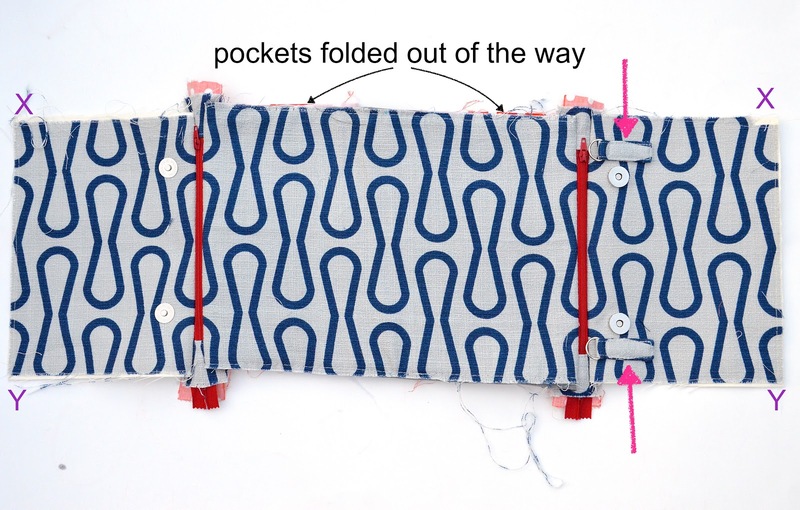 Fold the pocket pieces in half as shown to bring their remaining short free sides up to the zippers. 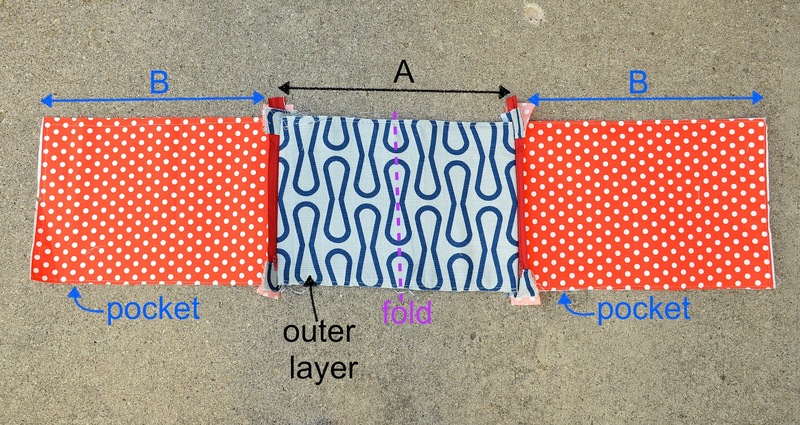 Notice that gap between the pocket folds - this is the happy consequence of making the B dimensions smaller than the A in Step 1. Face the remaining edge of the zippered tapes to these pocket edges and the septum pieces. 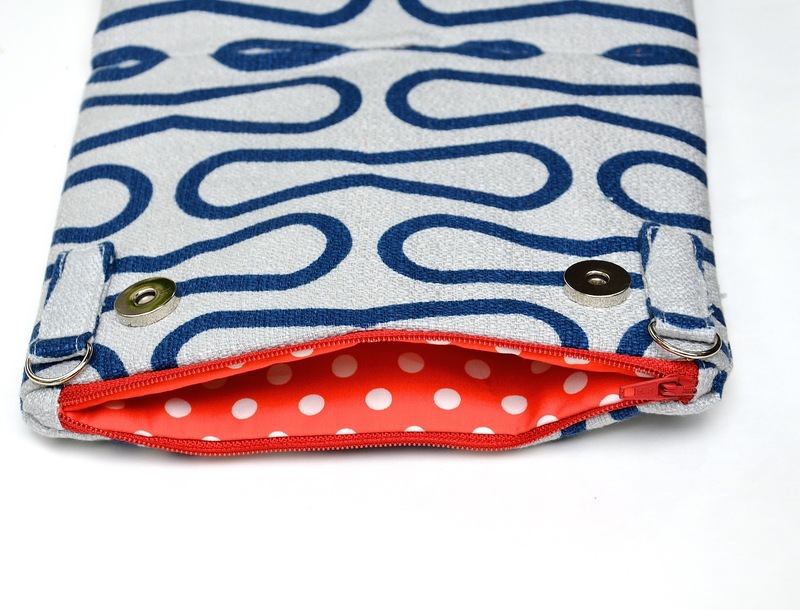 The pocket edges will lie against the WS of the zippers, and the septum edges will lie against the RS of the zippers. Here is that ensemble seen from the RS, with one septum piece sewn onto one of the zippers. 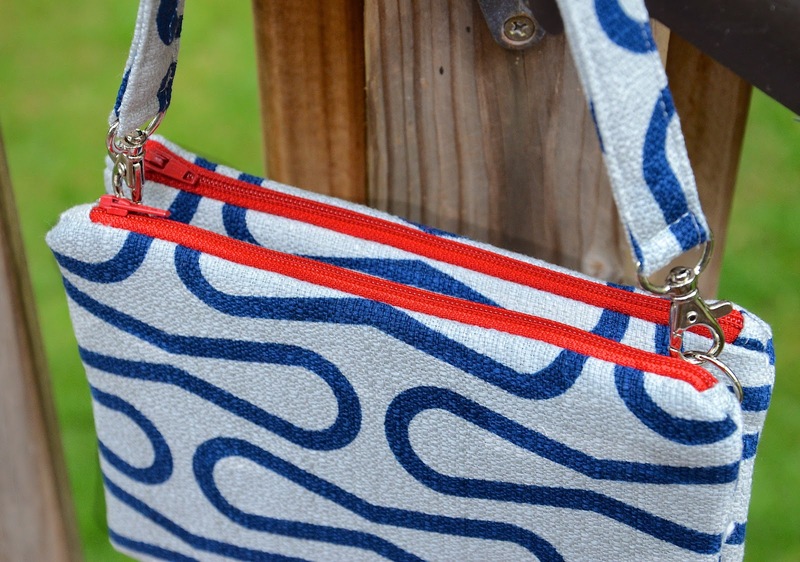 It's totally your call if you want to topstitch alongside the zipper. I didn't, because I thought it looked nicer this way. Here's what everything looks like on the RS now, with both septum pieces attached. In a later step, we'll be folding the clutch up so that the free short sides of the two septum pieces meet (X to X and Y to Y) and get sewn together. Let's fold everything up now to help you visualize all this. From this angle, you can see the folded pockets, attached to the WS of the zippers. You can also see the septum pieces, attached to the RS of the zippers, but folded into the middle/inside of the clutch. Finally, you can see the outer layer, folded around all those layers, and attached to the RS of the zippers. Common sense will tell you that the septum pieces are going to have to be trimmed in order to lie flat without bunching in the finished project. And here is a shot of the finished clutch, septum-side out, so you can visualize the location of XY, the seam joining the two septum pieces. Now fold the pockets out of the way, and add some hardware. Here, I've installed a pair of magnetic snaps on the septum pieces to fasten the clutch compartments together (green arrows). Next, I installed a pair of strap anchors to one of the septum pieces (pink arrows). 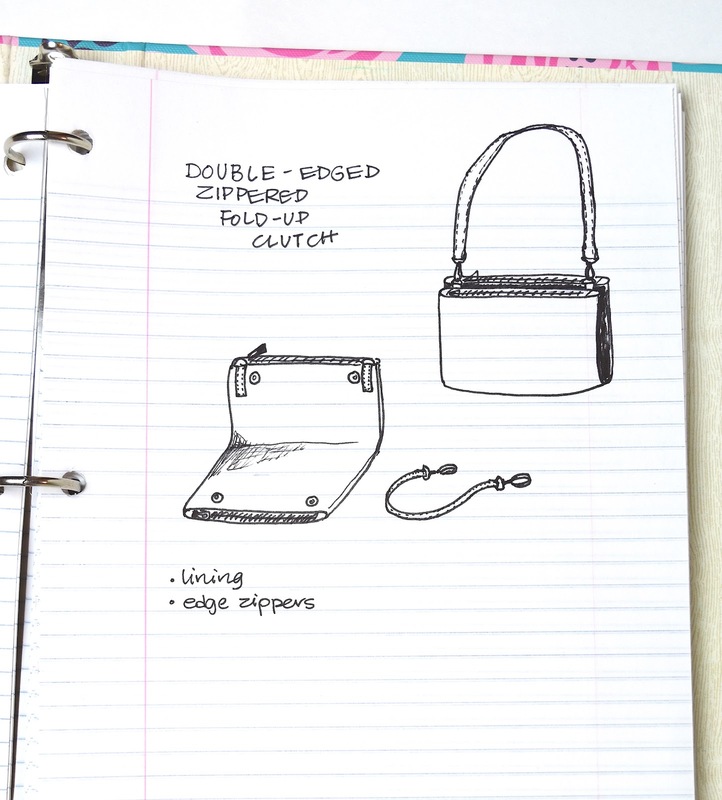 Note that in this design, the strap anchors are sandwiched between the twin compartments of the finished clutch. Feel free to attach yours on the outer layer, or even over the side seams if you prefer (in my construction sequence, the latter would've had to be attached by hand at the last stage). 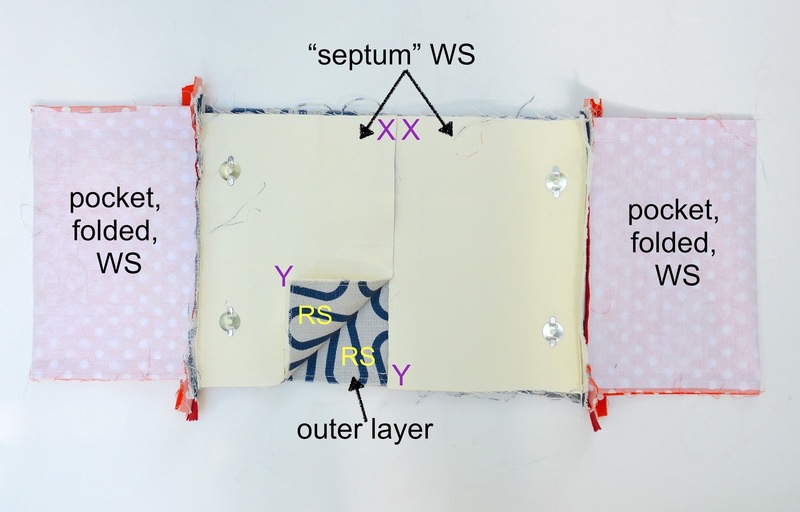 Bring the RS of the outer layer and septum pieces together, matching up the free edges (XY) of the septum pieces, as shown. This forms the outer "shell" of the clutch. Sew the side seams of the pocket. These will have a wider SA than the outer/septum layers, so the finished pocket will be smaller (widthwise) than the clutch to prevent crowding. Now fold the outer layer along its mid-fold line so the RS of the septum pieces come together and their free edges (XY) meet. Sew them together along this seam, leaving a gap for turning the entire clutch RS out later. Tip: to check for bunching between layers, turn the clutch RS out now for a preliminary check. Fold the clutch shut so the magnetic snaps engage. We want to be sure the septum lies flat. If it bunches, unpick and increase the SA of this XY seam, curving slightly toward the center if necessary, almost like a gentle dart. Here is the clutch turned WS out again. Now sew the side seams of the clutch shell i.e. those blue dashed lines. 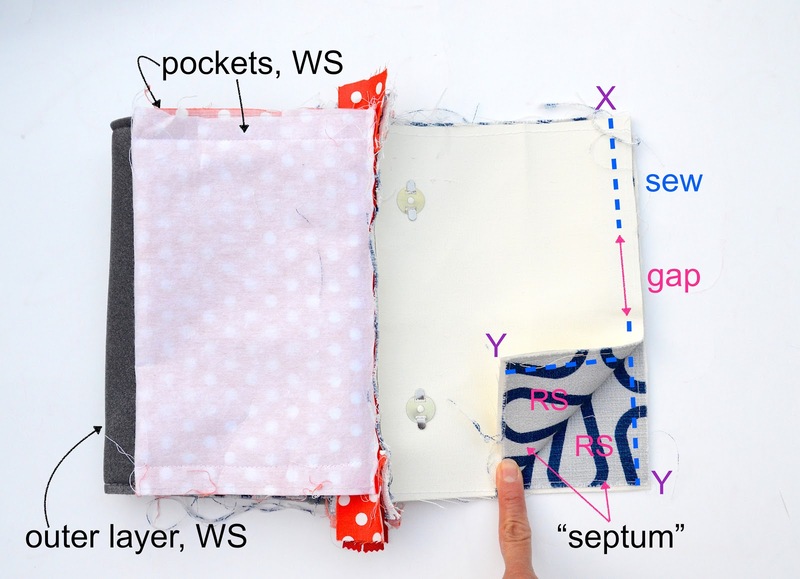 Remember that this shell is bigger than the pockets tucked inside it, so your stitching lines should be closer to the fabric edge than the seams of the pockets (purple dashed lines). 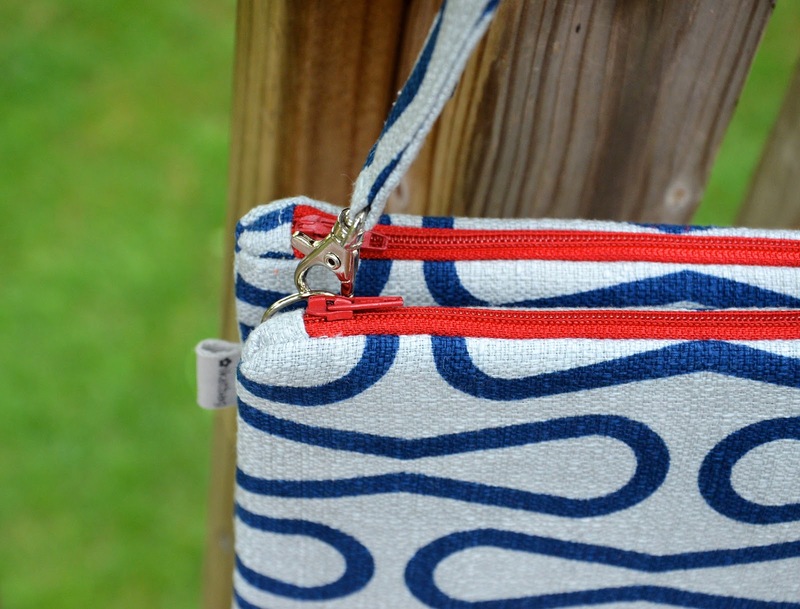 If you were able to visualize this, you might have recognized this step as the equivalent of this step in the single zippered-edge pouch, where the lining of that pouch is (one) pocket of this clutch. Trim the SA to reduce bulk, turn the entire clutch RS out through that gap in the septum seam, and hand-stitch the gap shut. And did you notice - by this point in the tutorial, you're not nearly as freaked out by "septum" as you were in the beginning? It almost feels like bona fide bag nomenclature, doesn't it? 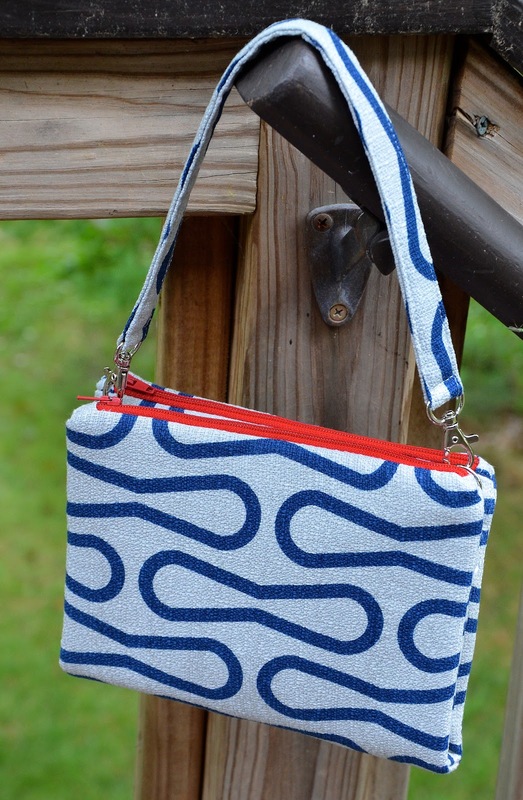 I have a little bag very similar to this, but the it's made with two separate single bags that are clipped together and each have a D-ring. It's terrifically useful - I especially like it for a night out when I just need a couple of things. Mine is starting to look a little worn, so I think I might add this to my list of "things I hope to sew one day". By the way, have you previously done any tutorials on making your D-ring strap anchors and the reversible strap handle? Yours look so much neater than anything I've ever attempted. 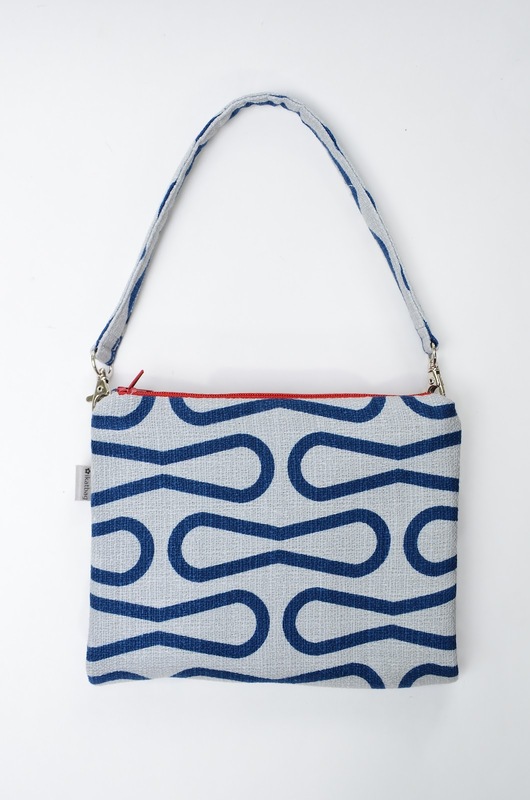 Katie - the link to the reversible strap is in the list of "I used" materials - scroll up to find it. 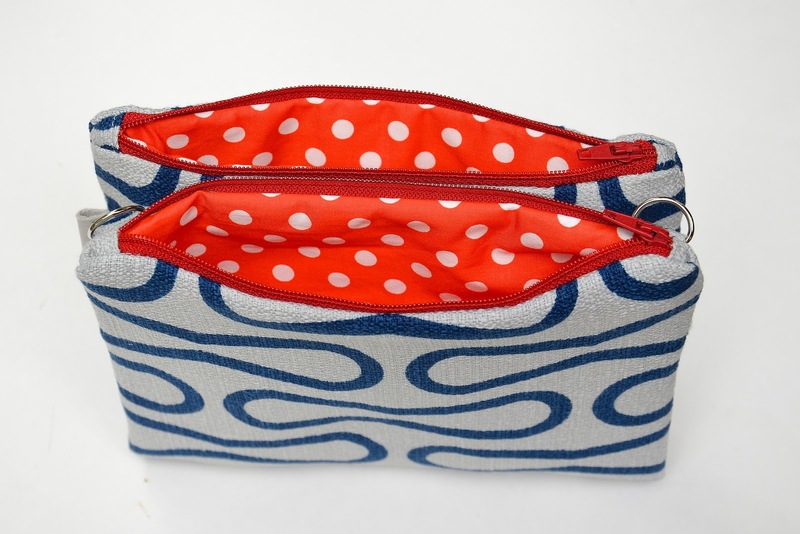 MaryAnne: The magnetic snaps would be strong enough to hold both compartments together, yes. And the zippers keep the openings shut, so nothing will spill out even if the snaps were disengaged. 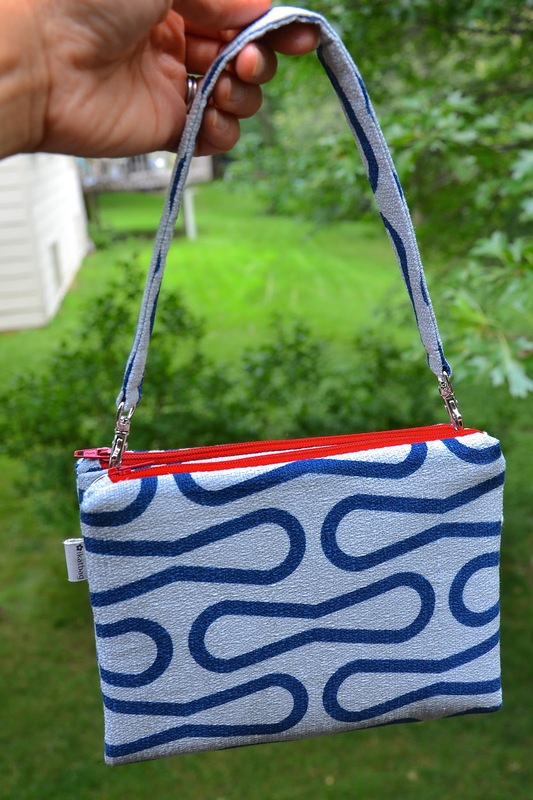 But I honestly don't know how much you could stuff into a flat-compartment clutch like this one. Not being a clutch person myself, I mean. Give me a satchel or a real handbag/purse/backpack anyday. I've seen similar pencilcases at work. I need one!!! it seems to be easy after reading your tuto...thanks Lier! 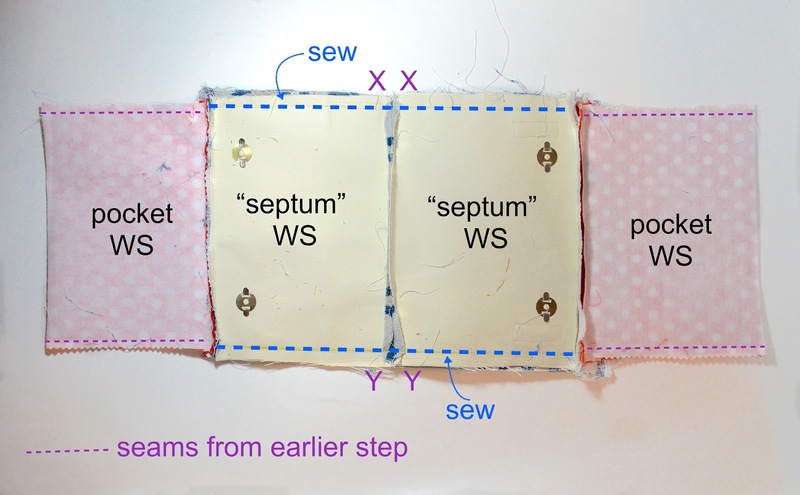 Could the septum pieces be sewn together intead of using the magnet straps? I've seen pencil cases sewn like this.